Getting out to fish or hunt ducks is a lot of fun, but it does involve being near – or on – the water; often you’ll be in a small boat, on your own or moving around at dawn. That means there’s always a risk, and to eliminate that you need a good fishing vest. The good news is that if you pick the right one, you can gain some handy extra storage for your gear. Whether you’re fly fishing, kayak fishing, floating in a tube, or just on the dock, the best fishing life jacket will keep you comfortable, organized, and of course safe. If you’re having your canine buddy tag along, be sure to also have him wear a dog life jacket. Are you wondering if the Stohlquist Fisherman is up to the task of stalking muskies, or even some early morning duck hunting? Don’t! This vest looks like it was designed by the Navy SEALs making it our pick for best fishing life vest. It’s neat, low profile and tough – the shell is heavy duty Cordura, with a softer oxford lining for comfort – and packs in plenty of buoyancy. There are two generous chest panels and a back panel that’s set high to keep it clear of seat backrests in a boat or the cockpit of a kayak. Open sides leave you with full arm movement, and plentiful adjustment straps – two each side plus one on each shoulder – make it really easy to get a perfect fit. It’ll keep you afloat, but will it hold all the tackle you need close to hand? Yes, definitely! pocket, plus looks to hold hemostats, pliers or other tools. As a final neat touch, the front panels are lined with a Velcro loop surface, so you can stick fly blocks to them. Each of the pockets has plenty room for small tackle boxes, compact radios and other essentials. Then each chest panel has an elastic loop for a whistle or compact flashlight, and a slotted hardpoint with an elastic strap ready fitted. There is absolutely no shortage of places to stow your gear. The Fisherman comes in two color options. The most popular is a discreet cactus green that won’t startle any wildlife. There’s also a bright yellow option with reflective strips front and back. The yellow is your best choice if you’ll be on open water. The NRS “Chinook” fishing PFD is one of the most comfortable fishing life vests you will ever put on. 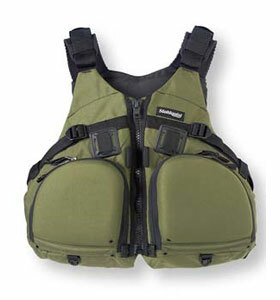 Available in 3 sizes and having 8 adjustment points, this PFD will fit almost any person. It’s great for fly fishing, kayak fishing, canoe fishing, or even fishing from your inflatable pontoon (pretty much any type of fishing). Many even use it for white water rafting. Using waders? The Chinook can be worn over them just fine. The mesh high back is designed to sit above a kayak perfectly. This is one well designed life vest for fishing since all pockets (there are 7) seem to be placed at the optimal spots. The only negatives we’ve seen are that some users think the pockets are a bit on the small side and it has a tendency to get a bit warm behind the front panels. Also, while the vest actually feels a bit more comfortable than the Stohlquist, the material doesn’t feel quite as durable. A fantastic vest nonetheless. One of the most impressive Type 3 PFDs for fishermen on the market, Onyx’s kayak fishing vest is full of features. The basic zippered, fleece-lined pockets and chest pocket are accompanied by a snap-close top slot for easy access to your radio or tools. A drop down tray pocket can be accessed by a single button press and can hold a small tackle box. There is also a lash tab to hold various items, making this vest the perfect storage for longer fishing trips. The padding on the back of the vest is higher to provide better seat clearance, while the lower portion is webbed for superior breathability. Six straps allow for precise adjustments, not only for body fit, but also to account for boat or kayak seat height. The vest comes in two sizes: a universal that fits chest measurements from 30 inches to 52 inches, and an oversize that fits 40 to 60 inch chests. We specifically recommend this fishing PFD for the bigger guys out there. While the pockets are not waterproof, the vest is designed with ample drainage to help keep the vest dry. 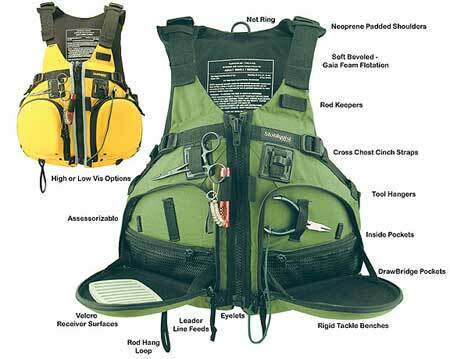 Finally, this Coast Guard-approved life vest provides approximately 15 pounds of lift pressure, which is well above the Level 3 requirements of 7 to 12 pounds. Most fishermen like a vest with lots of storage. But if you’re a minimalist or need something ultra-sleek for working in really tight spots, something like the Stohlquist Fisherman might be a bit too bulky. This Onyx M-24 manual inflatable vest (available in Camo or more traditional red/black) could be ideal for you in this situation. It’s simply a lightweight harness with a waist belt, back straps and two chest straps like the ones on a rucksack. However inside the right strap is a canister of compressed carbon dioxide; pull the T-handle at the bottom of that strap, and it will instantly inflate into a Coast Guard-approved flotation vest. If you hunt or fish in hot weather, this inflatable fishing vest keep you cooler than any conventional vest. Because of it’s compact size, the Onyx almost makes for a great kayak PFD and sailing PFD as well. The downside of an inflatable vest is that it can only be used once before having to replace the CO2 cartridge. Fortunately, it’s cheap and easy to do. The Osprey doesn’t look like a life vest at all; it has a really military look, with a total of seven pockets and a row of shell loops on the left breast. It’s also only available in camo or khaki, over black mesh. Underneath the tactical exterior it’s a fully functional flotation device, though, complete with zip, two-buckle straps and plenty of adjustment. Like the Stohlquist it’s also shaped for comfort when sitting in a kayak. If your main priority is gear storage this one is hard to beat – although the pockets aren’t as flexible as the Fisherman’s there are more of them. In your chart at the top, what does “Buoyancy” mean? Buoyancy simply means how many pounds of weight the life jacket will hold up in the water. An average 200 lb man only requires about 10 lbs of buoyancy to stay afloat in the water (once you factor the percentage of water and fat in a human). All of these vests are well above what’s needed. Hypothetically speaking, if you started at the bottom of a lake with each of these life vests, you’d float to the surface the fastest in the vest with the highest buoyancy. But in any case, you’d still float to the surface. How much weight might be added if your waders fill with water? Not sure of the exact weight but they won’t weigh you down in the water as much as you may think. If they fill up with water while in the water, they’ll become neutrally buoyant. It’s similar if you take an empty bucket and submerge it in water. In the water, it’s still fairly easy to move. But if you try to pull it out of the water when it’s full, THEN it will be heavy.